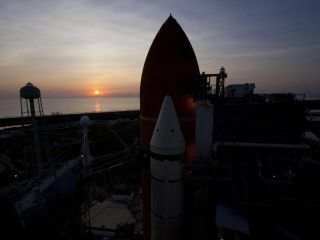 The sun rises over the Atlantic Ocean at NASA's Kennedy Space Center in Florida, illuminating space shuttle Atlantis' external fuel tank and solid rocket boosters on Launch Pad 39A. Launch is scheduled to take place for the STS-135 mission on July 8, 2011. This image was taken on June 23, 2011. This story was updated at 3 p.m. ET. CAPE CANAVERAL, Fla. — NASA is counting down toward launch the agency's final space shuttle mission on Friday (July 8), but Mother Nature may not cooperate. The countdown began this afternoon (June 5) and is ticking down to a planned zero at 11:26 a.m. EDT (1526 GMT) on Friday, but NASA is keeping a close eye on the weather. Forecasts call for a chance of rain and thunderstorms on Friday, meaning that shuttle Atlantis' final mission — the last ever for NASA's iconic shuttle program after 30 years of spaceflight — might be delayed, officials said today in a news briefing here at NASA's Kennedy Space Center. "I wish I had better weather for you, a better weather briefing for you," said shuttle weather officer Kathy Winters. "Right now, we're going with a 60 percent chance of KSC weather prohibiting launch due to the potential for showers and isolated thunderstorms in the area." NASA's preparations, for their part, are coming along nicely, with no problems apparent at the moment. Atlantis' payloads, which include a year's worth of supplies and spare parts for the International Space Station and an experiment to demonstrate robotic refueling of satellites in orbit, are also looking good, officials said. And Atlantis' four-astronaut crew is on site and working through their flight preparations. Commander Chris Ferguson, pilot Doug Hurley and mission specialists Rex Waldheim and Sandy Magnus flew in to KSC yesterday afternoon from Houston's Ellington Field, arriving aboard two T-38 supersonic jets. If bad weather scrubs Friday's launch, other windows open up Saturday morning and Sunday morning. And the outlook improves a bit each day, with the chance of weather problems dropping to 40 percent on Saturday and 30 percent on Sunday, Winters said. A delay would doubtless disappoint the huge throngs of shuttle-watchers that will descend on Florida's Space Coast to watch the last-ever blastoff of America's iconic space plane. NASA expects between 500,000 and 750,000 people to show up, Graeber said. Atlantis' STS-135 mission is slated to last 12 days to deliver supplies and spare parts to the International Space Stastion. NASA will retire its three-shuttle fleet for good to make way for a new program aimed at deep space exploration. The space agency aims to send astronauts to an asteroid by 2025 and then on to Mars by the mid-2030s. Atlantis and its fellow orbiters Endeavour and Discovery will become museum showpieces. You can follow SPACE.com senior writer Mike Wall on Twitter: @michaeldwall. Visit SPACE.com for complete coverage of Atlantis' final mission STS-135 or follow us @Spacedotcom and on Facebook.